A mechanical engineer, science educator, and entertainer, Bill Nye is best known as the host of Bill Nye the Science Guy, a science-education show for children that ran from 1993-1998. The show won 18 Emmys, of which Nye won seven as host and head writer. Nye is CEO of The Planetary Society, the world’s largest nongovernmental space interest organization, which was founded by Nye’s astronomy professor at Cornell, Carl Sagan. Nye has written six children’s books and recently published Undeniable: Evolution and the Science of Creation. He’s also writing a general interest book about energy. He was awarded the Ralph Coats Roe Medal by the American Society of Mechanical Engineers, and he holds honorary doctorates from Johns Hopkins, Rensselaer Polytechnic, Goucher, Quinnipiac, Williamette, and Lehigh Universities. 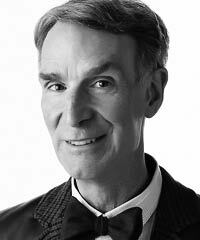 Nye speaks frequently to promote science education and related issues.